Download original Junior WAEC Questions and Answers . This is where you will get complete and up-to-date Junior WAEC JSS 3 Past Question and Answer in all subject. You can use is to prepare for your Basic Education Certificate Examination (BECE) which is written by students in the Junior Secondary School Upper Basic 3: NECO. Junior WAEC Exams Past Questions and Answers are past questions gotten from the Junior Secondary School Examination (JSCE) which is conducted for candidates in their third year of the Junior Secondary School. While each state of the federation and the FCT conducts the JSCE for its candidates, NECO conducts the JSCE for Federal Unity Colleges, Armed Forces Secondary Schools and other Federal establishments operating Secondary schools. Private Secondary schools also take part in the NECO JSCE provided they are permitted by their State Ministries of Education. Twenty two subjects are administered at the JSCE level. A candidate is expected to sit for a minimum of ten subjects and a maximum of thirteen. A candidate is deemed to have passed the JSCE if he/she has passes in six subjects including English and Mathematics. 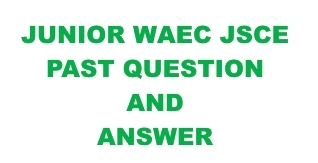 We have compiled all the Junior WAEC JSS 3 Past Question and Answer in all subject from 2009 till date and it’s available for download. The Junior WAEC exam is difficult to many candidates who do not have past questions. However, candidates who purchased the up to date past questions see the exam as very cheap because they practice all the questions before the exam. Some of them who bought the past questions from us last year made distinction in the BECE and they have scholarships to study in Federal and Unity Colleges. Only N2000 for the full package (all subjects – fully complied with answers) or N500 for just one subject. account I will send to you on request.